Lighting circuits are very simple with a DCC decoder. In principle you just need to connect a bulb or LED to the decoder's BLUE (common positive) wire via a protecting resistor, and the -VE leg of the light to one of the decoder's AUX/FA function outputs. In fact, the hardest aspect of fitting lighting to a model is finding routes for the wires to go! Bulbs are unusual these days, and it is suggested that you always used LEDs where possible - they produce less heat and will last a very long time. LEDs always need to be protected by a resistor. 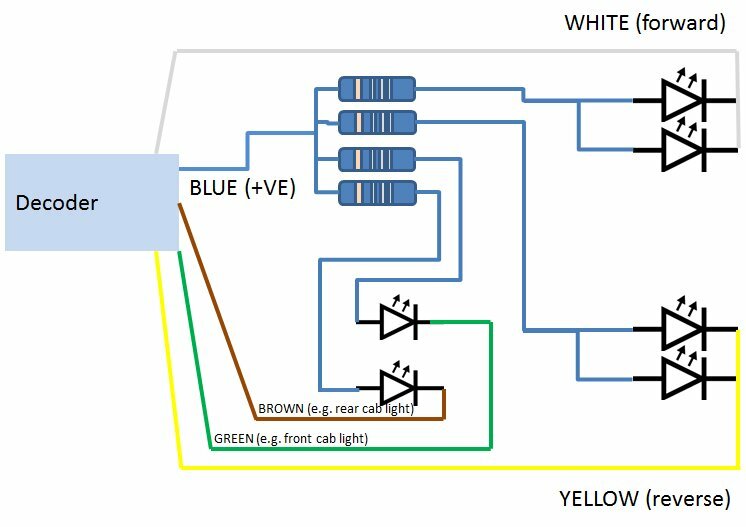 Most LEDs are between 1.5V and 5V, and the decoder drives AUX outputs normally around 12V, so protection is essential. Forgetting to added a resistor will not normally cause damage to the decoder, but the LED is likely to go 'pop' instantly. Every 'group' of LEDs should have its' own resistor, and where possible a resistor for each individual LED is a good idea. By 'group' we mean any group of LEDs that will be operated together e.g. both front white head lights. If a light is going to be controlled from a different Function Key then it will need its' own resistor, otherwise switching it on with cause the other lights that share the resistor to dim - not a great effect!